Very easy to access, reception desk staff was very supportive and helpful. lot of Berlin attraction easily accessible. We were six women on a girls' trip, we rented one deluxe suite and one standard room. Very nice apartments. Simple, basic furniture, comfortable, stylish, pleasing aesthetic. Kitchen well stocked. In hindsight the neighborhood was a little basic, cheesy, we would have preferred to stay in a more hip neighborhood. But there were many restaurants nearby. We walked to the Berlin Wall Museum. Great location, very clean, accessories in the room. Great choice of eateries around the property, noise is sheltered out, well-equipped, all thought-through. The room was really big. Perfect for my husband daughter and myself. It was very clean and in a good location. Well equipped kitchen for self-catering. Nice hot shower and very spacious. Nice view with great blackout curtains, and great heating while I was there in zero degree temperatures. Lock in a great price for Apartments Rosenthal Residence – rated 8.9 by recent guests! Apartments Rosenthal Residence This rating is a reflection of how the property compares to the industry standard when it comes to price, facilities and services available. It's based on a self-evaluation by the property. Use this rating to help choose your stay! One of our top picks in Berlin.Centrally located in the trendy Mitte district of Berlin, Apartments Rosenthal Residence offers pet-friendly self-catering accommodations featuring elegant modern décor and furnishings. Museum Island is 0.6 mi from the property. The accommodations is equipped with a seating area. A control pad, flat-screen TV with cable channels and blu-ray player are available in some units. 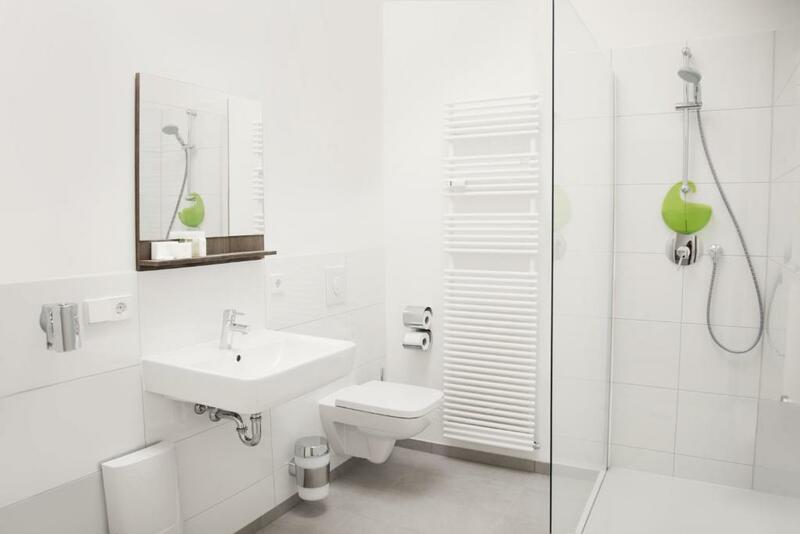 There is a private bathroom with a shower in every unit. Towels are provided. All apartments also come with a dining area and a kitchen equipped with a microwave, a toaster and a refrigerator as well as stovetop and a coffee machine. Guests not wanting to cook can visit one of the many restaurants located less than 350 feet from the property. Bicycle rental is also available for a daily fee. The tram and train station are located directly outside the apartments. Alexanderplatz is 0.7 mi from Apartments Rosenthal Residence, while Berlin TV Tower is 0.7 mi away. The nearest airport is Tegel Airport, 5 mi from Apartments Rosenthal Residence. When would you like to stay at Apartments Rosenthal Residence? This suite has a CD player, electric kettle and stovetop. Please note that some of these studios have a dishwasher, and these are subject to availability. Spacious suite consisting of 2 rooms, and including a flat-screen TV and a fully equipped kitchenette. Please note that the 2nd bedroom is a living room consisting of a large double bed as well as a sofa bed for 2 guests (see photos). This apartment has a balcony, microwave and toaster. This apartment features a balcony, stovetop and DVD player. We offer a Tablet PC in every Room. Our staff will help you explore Berlin to the fullest. House Rules Apartments Rosenthal Residence takes special requests – add in the next step! Debit card Apartments Rosenthal Residence accepts these cards and reserves the right to temporarily hold an amount prior to arrival. Apartments Rosenthal Residence accepts these cards and reserves the right to temporarily hold an amount prior to arrival. On check-in, the property may pre-authorize your credit card for an amount between EUR 300 and EUR 600, depending on the apartment booked. On check-in, guests are required to present a photo ID as well as the credit card used to make the booking. Please note the reception is only staffed between 09:00 and 21:00. Guests booking after 18:00 and checking in the same evening must note that no extra beds or no cots can be arranged at such short notice. Please note that the property is located in the heart of Berlin in front of a tram line. Guests may experience some noise disturbances. Guests arriving by car should also ensure they purchase an environmental sticker (in German: Umweltplakette) in advance and display this on their car. Very noisy during the night . Room was quite small for 4 persons. The facilities are amazing!!! Smart tv plus speaker and a nice kitchen with mini bar!!! Friendly staff, amazing location surrounding by good food!!!! We booked the deluxe suite which was very well presented and spacious. It was clean and met our needs. The staff was friendly, helpful and very professional. We had expected a two-bedroom to mean two separate bedrooms and a separate living area, not two separate sleeping rooms with the living room in one of the bedrooms. It could just be our misinterpetation or not reading the descriptions well enough. The tablet wasn’t connected/didn not work. We did not think these were issues, but thought we should highlight this to spell it out. It is a great place and we recommend this accomodation. We will definitely stay here again for our next visit. Outdated rooms , synthetic bed linen - although very comfortable beds . Fantadtic location , great staff . Host delayed in replying to emails. Later was told they no longer do grocery service although they advertise this service. Apartment was really clean and really modern. Dishwasher made everything easy and WiFi was good. Unhappy with the excess noise from the universe apartment!! Everything fine except for lound music during both nights which didn‘t really help with trying to sleep. For adults the mattresses should be firmer IMHO as I did get an achy back. 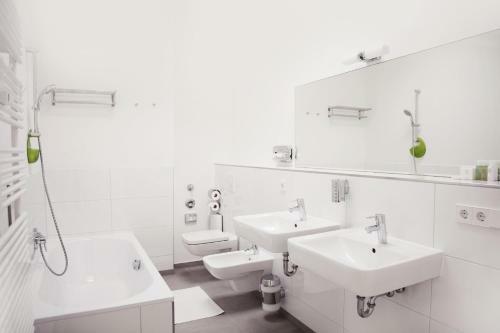 The bathroom was large, two basins; very nice clean etc. Everything was nice and clean, the apartments looked very recent. Location was also great, very close to metro stations, the TV tower is a 10 minute walk away. Would stay again. I had a beautiful stay in my Rosenthal Apartment. Perfect check in, kind & helpful staff, apartment comfortable, clean & warm, good space (even to have some yoga) and well acoustic isolated. I had rainy & cold days in Berlin so coming back to relax in my apartment with the small functional kitchen was simply perfect. Public metro up and underground at 1 minute walk. Nearby to restaurants and bars (also healthy). I can only recommend!